ROME (CNS) — The Eucharist is the seal of God’s covenant, uniting Christians and giving them the strength to bring God’s love to others, even when faith carries a high price, Pope Francis said. Celebrating the feast of the Body and Blood of Christ with an evening Mass outside Rome’s Basilica of St. John Lateran June 4, Pope Francis said the church and its members will never cease being in awe of the Eucharist. As the sun began to set, the Mass was followed by a traditional Corpus Christi procession from St. John Lateran to the Basilica of St. Mary Major, one mile away. Division and losing heart are “a danger, a threat,” he said, but the gift of Christ’s presence in his body and blood give Christians the strength to resist them. “We scatter when we are not docile to the Lord’s word, when we do not live in brotherhood, when we compete to occupy the best places — being climbers, you know — when we do not find the courage to give a witness of charity, when we are unable to offer hope,” he said. 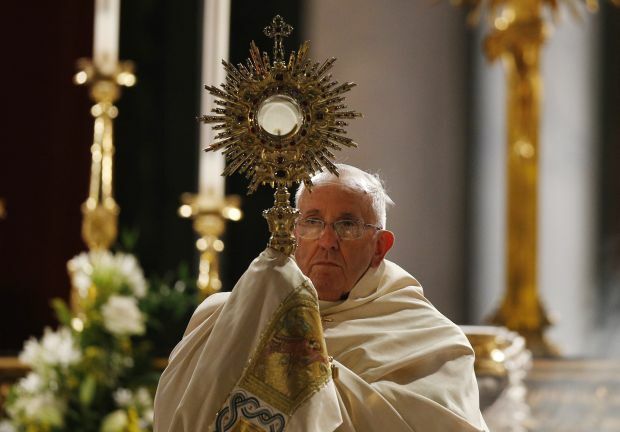 But the Eucharist is “the bond of communion” and the constant sign of the love of Christ who died on the cross “so that we would remain united,” he said. “Christ, present among us under the sign of bread and wine, demands that power of love overcome every fracture and, at the same time, become communion with the poor, support for the weak and fraternal concern for those who struggle to bear the weight of daily life and are in danger of losing their faith,” Pope Francis said. As he did last year, Pope Francis celebrated the Mass and then rode in a car to St. Mary Major to meet the Corpus Christi procession as it arrived and to officiate at the Benediction of the Blessed Sacrament. The Eucharist had been carried on a flatbed truck with two deacons kneeling alongside it. Thousands of Catholics — members of confraternities, dozens of cardinals and bishops, plus hundreds of sisters and priests — accompanied the truck, carrying candles as darkness fell. The truck bore the Vatican license plate “SCV 1,” the special plate usually reserved for the pope.